Word broke earlier this month that Amazon was preparing a new Kindle Fire trio for release later this year, and today more fuel has been thrown on that rumor's embers. BGR, which initially reported the refresh, has additional spec info for the HD versions. There's little on new data for the next entry-level Kindle Fire, which was previously reported as jumping in screen res to 1280 x 800. We did learn today that it will reportedly come in 8GB, 16GB and 32GB flavors. As for the high-def crowd, the Kindle Fire HD 7" replacement is said to come with a 1920 x 1200 screen and sport a new design (we already knew that), but now we're also hearing that it will feature a quad-core Snapdragon 800 SoC, complete with four Krait 400 CPUs and Adreno 330 graphics. Prototypes of the upcoming 7-inch HD are apparently hitting around 2GHz. For those keeping score at home, the new Nexus 7 runs a 1.5GHz Snapdragon S4 Pro SoC, comprised of a quad-core Krait CPU and solo core Adreno 320 GPU. RAM is said to see a boost to 2GB (up from 1GB), and it will supposedly ship in 16GB, 32GB and 64GB variants. Current tester models of the new 7-inch HD are running an old OS - Android 4.2.2 - but with heavy Amazon touches. Wi-Fi, a front-facing camera and cellular connection capacity round out the tab's potential specs. 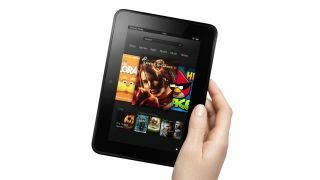 The 8.9-inch Kindle Fire HD, meanwhile, might come with a resolution-busting 2560 x 1600 display. It too will house a Snapdragon 800 and 2GB of RAM. While Wi-Fi, optional cellular data support and multiple internal storage options are part of its package; the larger HD will also apparently receive a rear-facing 8MP snapper. According to BGR's sources, the new HDs are vast improvements over on-the-market models, with the slates slipping into a more comfortable and lighter mold. Benchmarks have the HDs running three times better than current offerings, according to the report. Amazon is said to be aiming for a fall launch for all three tablets, and may even go for a late September unveiling. Though the online retailer is apparently looking to keep pricing close to current levels, there will be variation since different storage options will be available. If true, we're a few months away from these new Kindle Fires. Until then, read up on the new Nexus 7.